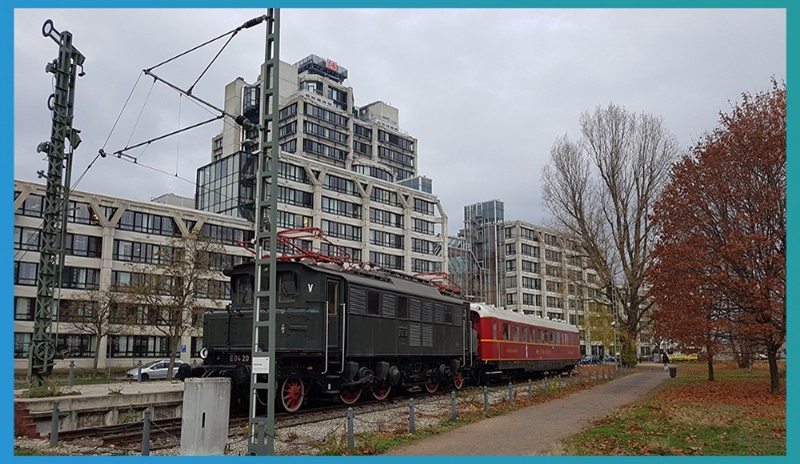 Consulted by Deutsche Bahn / DB Vertrieb GmbH to work on content for a workshop of an internal entrepreneurship program, Unibright evaluated on tokenizing the ecosystem around a public transport company with the help of Blockchain technology. 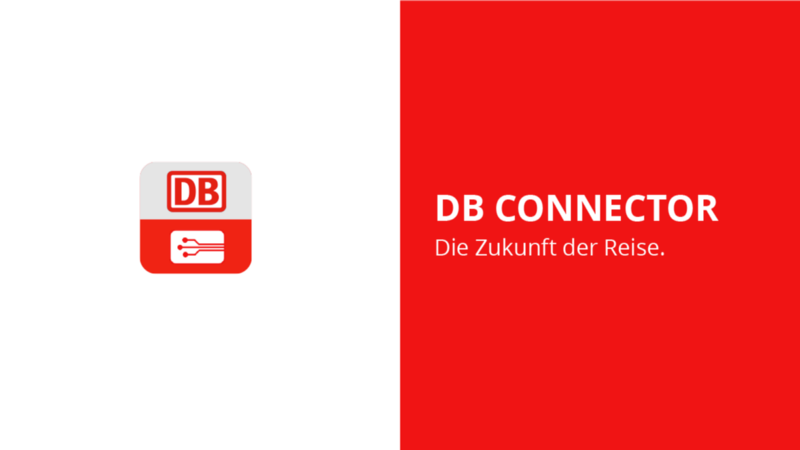 Deutsche Bahn AG is a German railway company and is the largest railway operator and infrastructure owner in Europe. Deutsche Bahn was the largest railway company in the world by revenue in 2015. It carries about two billion passengers each year. 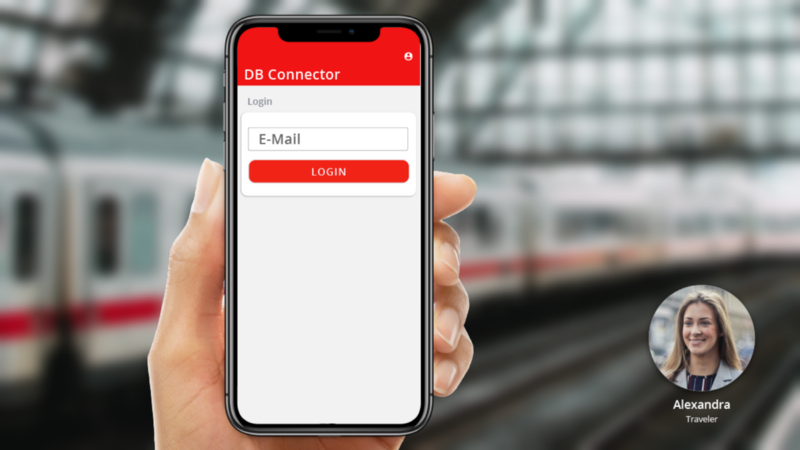 In the current state, customers of DB can already use different channels to get a specific ticket for a specific train. 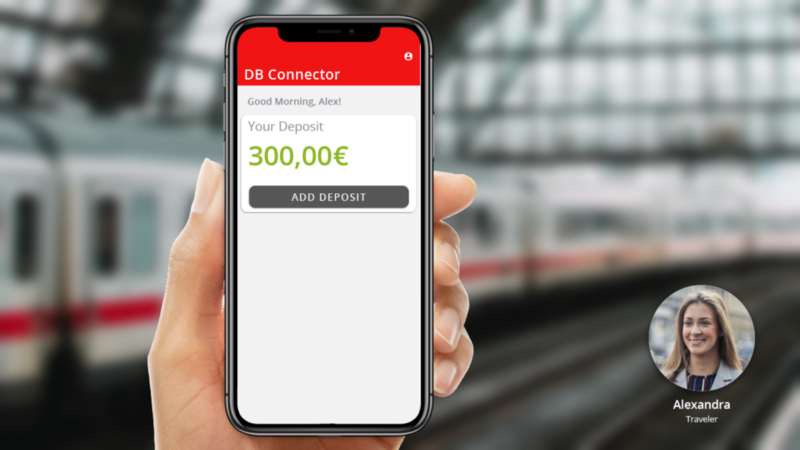 A customer can get a ticket online via www.bahn.de, at a desk, at a ticket machine or by using the app “DB Navigator” on a smartphone. Some of these tickets are personalized, some are anonymous. 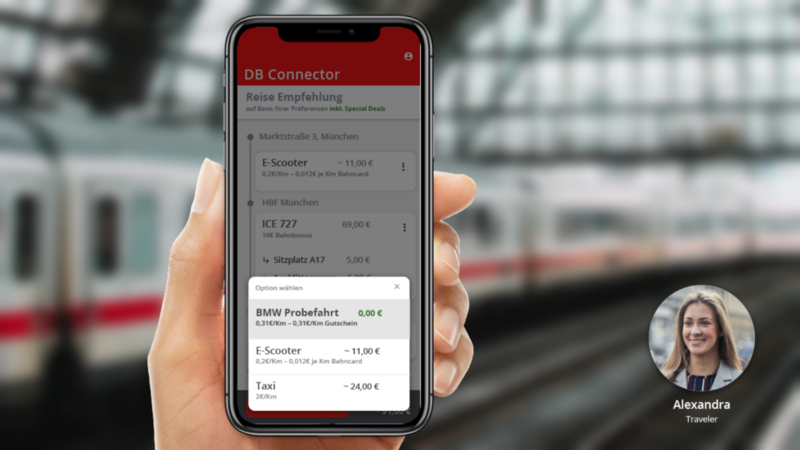 Some of these tickets are printed, some can be stored online, while the tickets bought via the DB Navigator app can also be stored right within the customer’s smartphone. Furthermore, travellers have access to a wide variety of additional services alongside a specific travel: Local transport from or to the first station, catering provided both on and off the train, plus many individual businesses in the local surrounding of a station, like hotels, restaurants and taxi companies. Together, they developed a blockchain based solution for bringing together all connected services around a travel (tickets, vouchers, local transport, accommodation, local train networks). Unibright was instructed to do a 4-week-deep dive and preparation of a DB internal kick-off workshop to prepare the project, to extract parts of the concept that can be potentially put into a business and to consult on possible implementation and integration matters. Telling from the project’s name, the terms of the working title “Ecosystem Tokenization via Blockchain” shall be explained and motivated. There are both structural and technical views on an ecosystem. 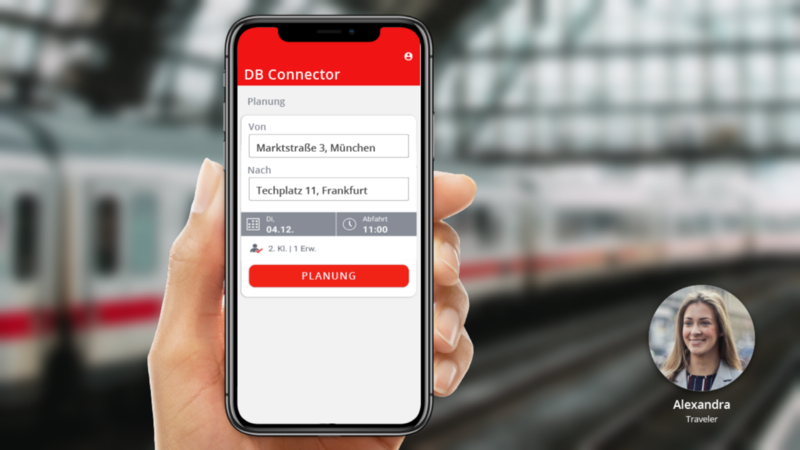 Structural, the Deutsche Bahn and all connected service providers already build an ecosystem. From a customer’s point of view, some actors in this ecosystem are already connected, e.g. when a customer buys a ticket and the corresponding travel is fulfilled by both Deutsche Bahn trains and local trains of independent providers. Other players are not yet fully integrated, e.g. the surrounding services like hotels. A loose coupling of the involved players is provided by vouchers Deutsche Bahn offers, e.g. a hotel voucher a customer can use when he missed the last connecting train due to a train delay. Technical, an ecosystem is defined by datastreams between different companies and their underlying IT systems. Some of these datastreams may be defined and empowered by the offering of APIs on one or both sides of the connection. Other data streams may exist but are not yet supported by an automated integration. 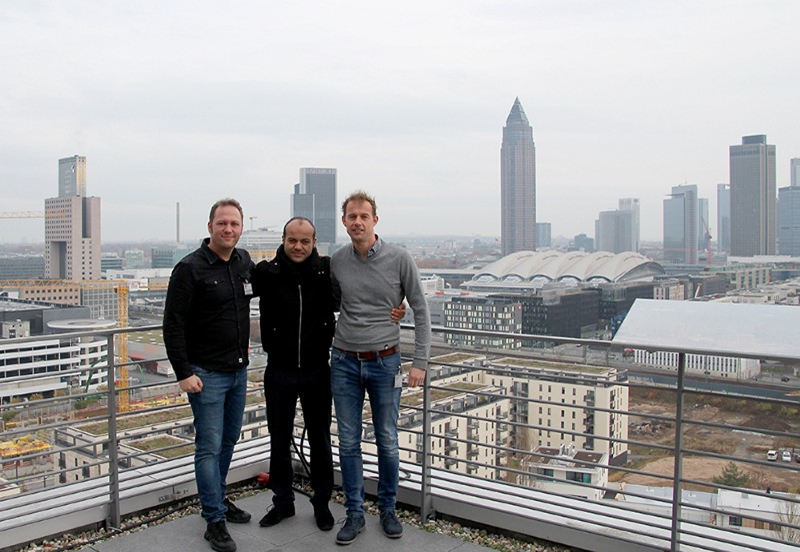 One goal of the workshop concept was to define better, which players can be part of an ecosystem around Deutsche Bahn and to make proposals on how this ecosystem can be built. The result should feel natural to the customer and provide tangible advantage. The method chosen to build an ecosystem in this challenge is Tokenization. Basically, it means to transfer the participating values and assets into tokens, that act like value representatives or vouchers with a specific sense in the ecosystem. Tokens can be configured as transferable, partial, controllable and can be restricted in their use due to location, time or events. 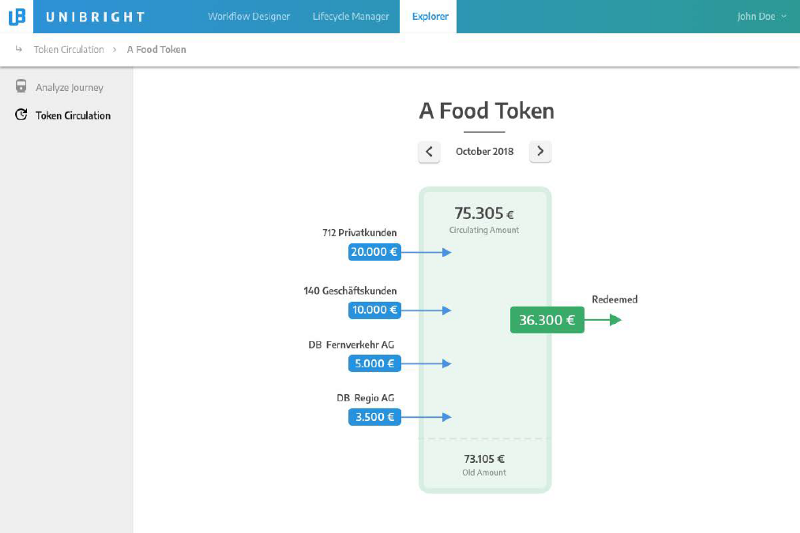 One goal of the workshop concept was to tokenize values and assets that can be part of that future ecosystem, and also to check on possible transformations of existing value based systems like “BahnBonus-Punkte” (a reward program where a customer can collect points for each ticket purchase). Blockchain is the perfect technology to build tokenized ecosystems. The values in a blockchain can be personalized while not being centralized. The concept of “trustless trust” is defined by blockchain technology itself, making it easier for new participants to decide on becoming part of the ecosystem. And finally, the client has a real benefit of being part of a decentralized ecosystem and implicitly strengthens the ecosystem by using it. The technical part of integrating existing players into a newly build ecosystem is not trivial. Therefore, one goal of the workshop concept was to show, which parts of the solution can live in a blockchain and how can they be integrated with the “off-chain world”, a challenge that is explicitly targeted by the Unibright Framework. The basic idea is to represent all parts of a common “journey” by tokens on a blockchain. This means single travels (or travelled miles), services, catering, hotel bookings, local transport or other assets that bring value to the overall journey. These assets can be purchased by the customer, to save them in a personal wallet. The customer can transfer these assets, in a whole or divided into parts, he can perhaps sell them or give them back to the issuer. The use of a specific asset is then carried out by transferring the corresponding tokens from the customer’s wallet to those of the service provider. To enable the process, the following roles are defined. On these roles, the following processes are defined. Different suppliers can define new assets (= issuing new tokens) and bring them into the ecosystem. These tokens can be (independently) redeemed for their initial purpose and also be bought later to refill the personal balance. 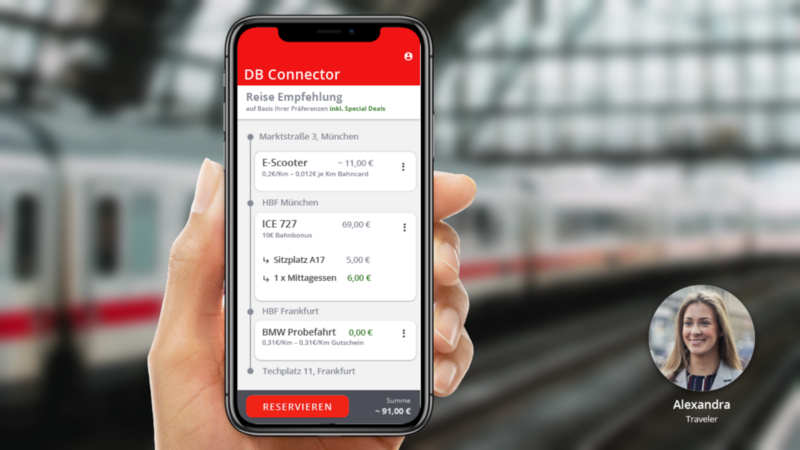 In the example shown in the following image, “Token A” could be issued by Deutsche Bahn directly and would be redeemed per driven mile in a long-distance train (the current model does not work on billing per mile, but billing per relation). A big benefit arises from the option to connect and convert different assets from the ecosystem. For example, generic conversions can serve as a transformation of miles in long-distance trains to miles in local transport trains. The conversion rate could be adapted due to specific events, e.g. DB motivating a consumer to rather use a local train due to a temporal higher workload in the long-distance train network. These conversions could be offered depending on location (specific train), depending on time (“only valid in the next 20 minutes”), or automatically, based on specific events (“delay> 29 minutes”). For the Proof of Concept, 4 different areas were covered. 	A token and asset model based on NEM features, including a basic REST-API, working on these assets and offering the most important operations. 	Views for the customer, to show the experience of a tokenized ecosystem from a consumer’s perspective. 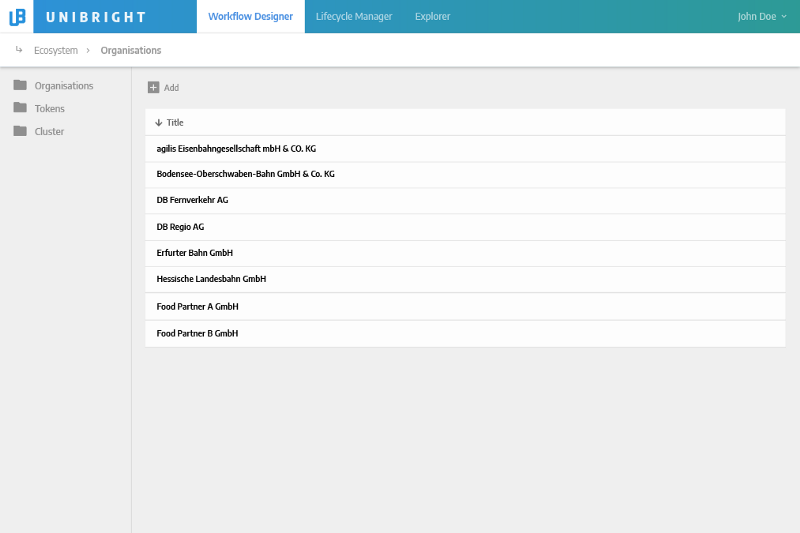 	Views for the responsible designer of the ecosystem, using the Unibright Workflow Designer. 	Views for the responsible manager of the ecosystem, using the Unibright Explorer. The described solution is based on the NEM Protocol, offering different smart assets and operations based on NEM features. You can read on the used NEM features(tokens, wallets, levys…) on the official NEM documentation. 	Transferring tokens: As soon as the service is provided, the corresponding reverse tokens are sent to the wallet of the user using that service. The number of reverse tokens may differ from the amount of initially calculated tokens due to event-based discounts or conversions from other tokens. 	Clearing: Periodically, a “clearing” is performed. The amount of reverse tokens per asset controls the refund of the initial asset token to the issuer, hence clearing the reverse tokens. If fiat money is involved, the different service providers can now receive the money from the central issuer. For the customer, the main advantage of purchasing assets in an ecosystem of a public transport company is the option to book a journey as a complete experience. For the workshop, we presented a “door-to-door” solution, assuming a customer wants to book a journey from his very home to a dedicated end location. Below, you find the screens of the customer walkthrough. Different parts of the journey are presented, including a “door to station”-component (“E-Scooter”) and an additional service to get to the target location, here a free test drive of a car company. This marketing based offer can be replaced by paid offers of alternative providers. If unexpected events occur, like a delay on the current train, Alexandra gets a notification and an instant “bonus” (in this case a free voucher for the board restaurant). 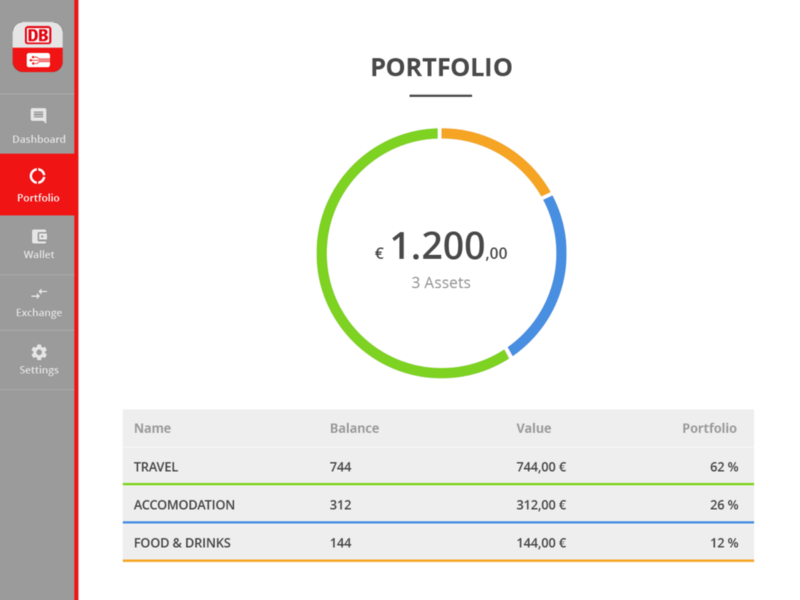 An alternative “detail” view, show the different assets that lead to the current overall balance of a customer. 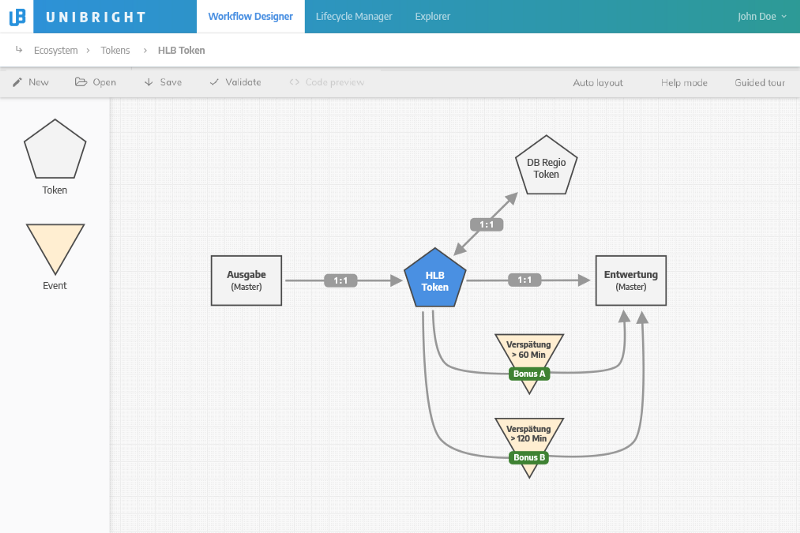 With the Unibright Framework, a blockchain based process is designed visually, and all blockchain related objects are generated automatically. To leverage all potential of an ecosystem, it is vital to ensure that new participants can be added at a later time. 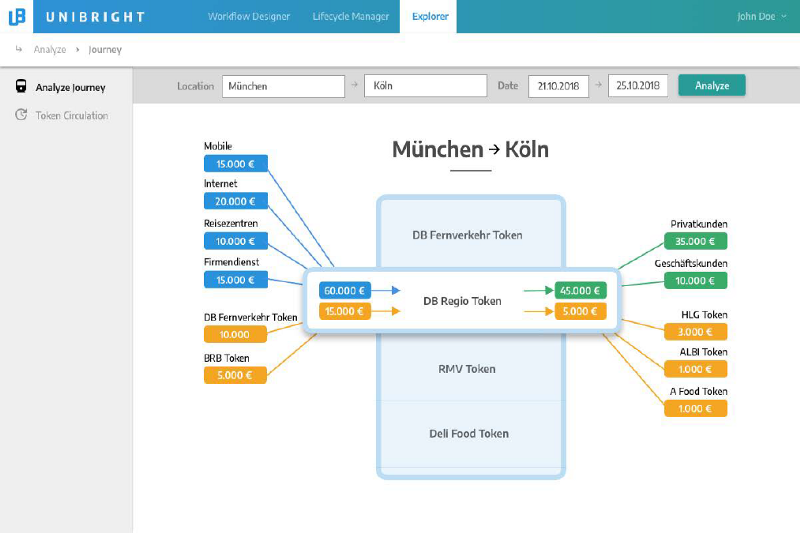 Therefore, Unibright made proposals for managing existing and new tokens within the Unibright Workflow Designer, using the “Ecosystem Tokenization Template”. The first of three managing units are the “Organisations” who are part of the Ecosystem. Different organisations use different tokens to bring their assets into the ecosystem. 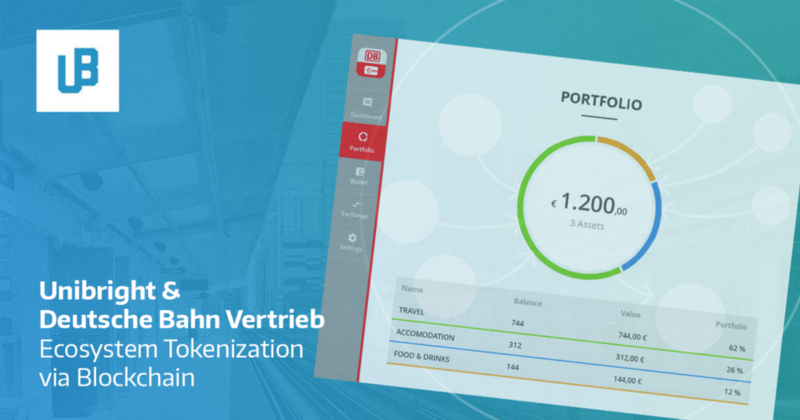 Tokens can be organized in clusters (like travel, food or accommodation). 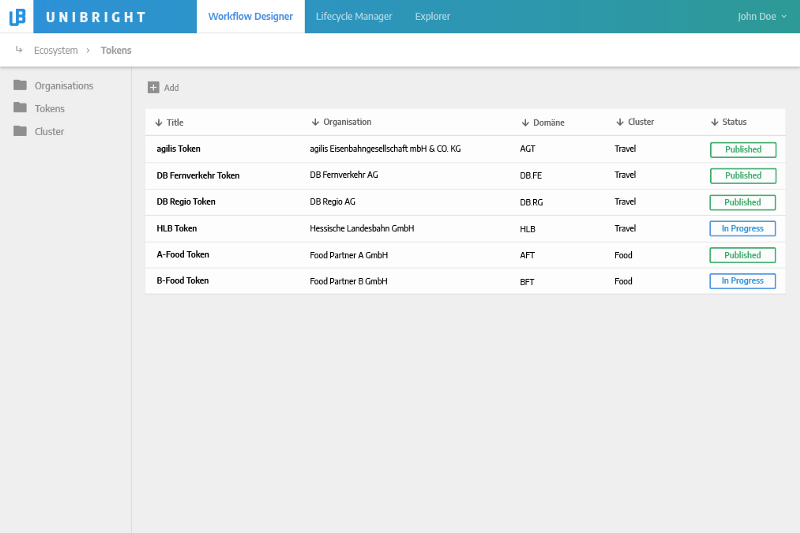 Within the Unibright Workflow Designer, different tokens and their “interplay” can be modeled visually. In this case, the conversion rate between two different tokens is visualized. Moreover, events that may affect the number of tokens needed for redemption can be defined. Every new business process established, needs a proper monitoring, empowering the user to learn from the data arising. With the Unibright Explorer, a business specialist can monitor the ongoing process without needing to know any blockchain specific know-how. An explorer view, showing purchased (blue), redeemed (green) and converted (orange) token amounts on a specific route in a specific time. The drill-in view for a specific token, giving details on token amounts of different clusters. Explorer view for the circulation of a specific token in a specific time range. The focus of the workshop was the outlining of the future potential of a tokenized ecosystem in terms of “what could be done?”. The outcome of the workshop will not lead to a near-term implementation but is the basis to extract a specific business case for the internal entrepreneurship. For example, the first step towards an implementation could be to establish one specific voucher system of one specific service provider on a blockchain based implementation. Building open, but integrated solutions, enabling adding of new partners into an existing ecosystem, automated offers and benefits for the customer while protecting personal data is a huge challenge. Additional demands may arise from law-giving entities and consumer protection. Blockchain-based tokenization can really help in transforming concepts into reality. With the concept of a blockchain based token ecosystem, relying on “trustless trust”, we can get one step closer to an independent acceptance of services of different suppliers. We can expand company wide insights to market-wide insights and build new distribution channels and markets. This enables us to better understand and know our customers, and their demands. 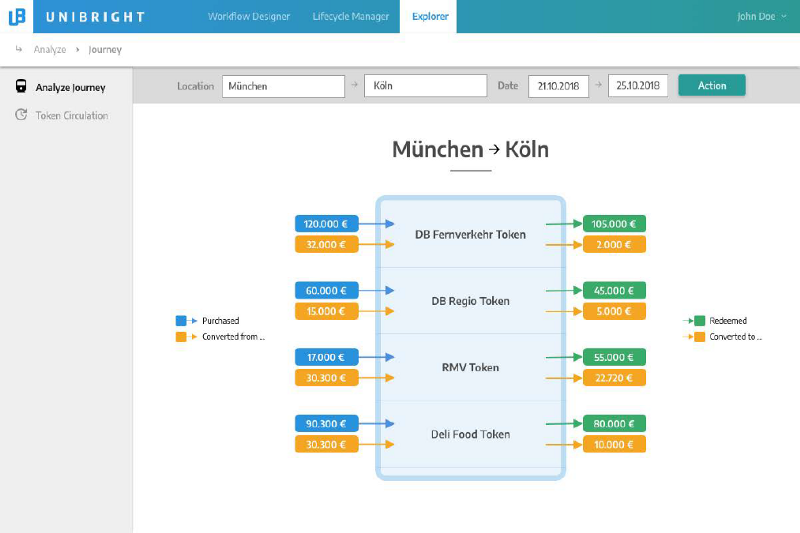 With Unibright, I found a convincing and generic IT solution to rapidly implement and monitor a blockchain token economy. Unibright offers a unified framework, bringing blockchain technology and smart contracts to mainstream usage. With its “no-coding-needed” approach, smart contracts get generated, deployed and updated automatically into different blockchains. Unibright works with visual, use case-related templates and also automatically integrates existing IT systems into the blockchain. Unibright Solutions, a dedicated consulting branch to support blockchain use in business processes, was additionally launched in December 2018.